This week, Amazon set the race for best gadget ablaze, tabloids speculated Hollywood splits, and Rosh Hashanah prompted celebration and reflection. As in the headlines, excitement abounded in Six-Word Memoir submissions, ranging from high school reunions to license revocations. Below are the best and wittiest stories of the week, with more to be discovered by clicking on each author’s name. 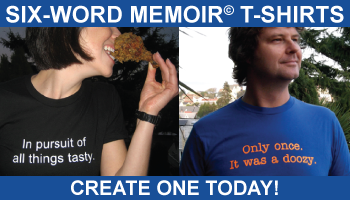 Kudos, fellow memoirists, in your features in the Best Six-word Memoirs of the Week Yay!